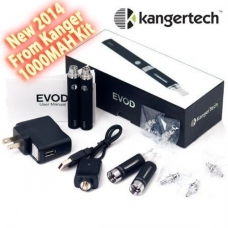 New Kanger EVOD Starter kit 1000MAH with BCC (Bottom Changable Coil) Clearomizer great peformance with the Kanger E-Vod clearomizer. The EVOD clearomizer has the same type of bottom coil heating system as the Kanger MT3, But the EVOD's bottom coil head and metal base are detachable, so when the coil head dies, you can keep the metal base and replace only the mini coil head. Each EVOD clearomizer can hold 1.6ml of ejuice, so some call it a Mini MT3. Each EVOD battery has 3.7V constant output voltage, which makes sure its constant performance no matter it is fully charged or not.